My great grandmother, my grandmother and my mom have all mastered the art of making homemade noodles. While I have actually taken classes to learn how to do this, it wasn't until this past Thanksgiving, when my mom specifically asked me to take over this part of our dinner, that I settled myself down and learned the craft of making homemade noodles. When we were younger, my sister and I liked to make fun of my mom's noodles. They were not very uniform in size and a little tough, but we would eat bowlfuls of them and even eat them cold the next day. We loved those noodles, made with homemade turkey broth. So needless to say, I was a bit nervous about the whole experience, because, as they say, I can dish it out, but can I take it? My recipe was given to my mom by my grandmother and so on, and goes something like this: four handfuls of good flour, a teaspoon or so of salt, and four eggs. Put the flour in the middle of your countertop, make four wells, sprinkle the salt over the flour, crack an egg into a teacup and pour the egg into the well. stir the flour into the egg until it is well incorporated and do that four times. Add more flour to the top of the counter and knead the dough a few times or until its not sticky. Let the dough rest for 20 minutes or so. Roll out half the dough, let the other half continue to rest. Roll out to about 1/4 inch thick. My own idea: cut the dough with a pizza cutter dipped in flour. The cutting goes super fast! Cut into the size noodles that you want. Do the second batch. Let noodles dry for two hours. Bring clear turkey broth to a boil. Drop noodles into broth, stirring to keep noodles from sticking to one another. Bring back up to a boil and then simmer. Salt and pepper as desired. Top with some chopped fresh parsley. Do you have a family tradition centered around noodles? Do you make homemade noodles but in a different way? I'd love to hear about it in the comments below! Homemade noodles are pretty much the best things in the world!! Yours look amazing, and would hold a place of honor on my Thanksgiving table, too. Terri I just love homemade pasta and noodles. Nothing better than a family recipe to get you going! Love it! Well-done on following the family's tradition of making homemade noodles. I absolutely LOOOOOOOOOVE homemade noodles like these. My great-grandma made them and passed them down through the generations. We like them much like yours look, a little thicker - almost like a dumpling/noodle hybrid. Now I want a big bowl of turkey and noodles! What a wonderful tradition. I made homemade pasta as well but I love the love and tenderness that went into your noodles. Yum! They sound delicious with turkey broth! I love homemade noodles. We always had them in our soup in Pennsylvania growing up. 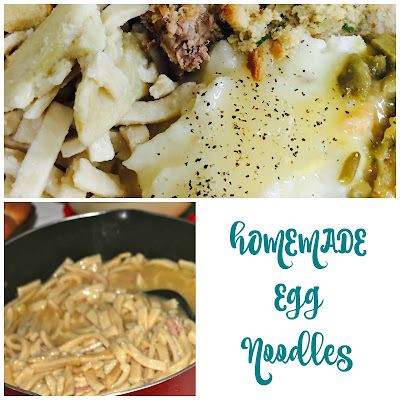 There is nothing better than homemade noodles! Sounds like you did great! Yum! Homemade noodles are the BEST! I love them so much. Your noodles look amazing too. What an incredible tradition. I've not yet braved an attempt at the art of noodle making myself. Some day.